It is my pleasure to bring to your attention this handsomely packaged hardcover book, The Wes Anderson Collection: The Grand Budapest Hotel. Written by American film critic Matt Zoller Seitz, this book takes a comprehensive behind-the-scenes look at Anderson’s eighth film. By comprehensive, it contains detailed, in-depth discussions with Anderson and the topics ranged from how Anderson got his inspiration for the story to why he cast the unknown Tony Revolori as the protagonist, Zero to how he created an entire imaginary world. Like Anderson’s layered form of storytelling, the book is classily divided into three acts. In addition to interviews with Anderson, the art of movie costumes and Wes Anderson style is also dissect in Act 1. It also includes an interview with actor Ralph Fiennes and bios of his fellow cast members. Act 2 contains interviews with composer Alexandre Desplat and production designer Adam Stockhausen and the last Act delves into the challenge of shooting in aspect ratio 4:3 and also an interview with Anderson’s long-time collaborator cinematographer Robert Yeoman. Besides lengthy Q&As, the book also contains lots of wondrous pictures of production artworks and amazing behind-the-scenes photos. In this case, proving the beauty of employing miniature effects and notably the clever usage of a cheap moving plywood platform. Film students will also be enthralled by the essays written by film critics and theorists while excerpts from Stefan Zweig’s writings (a late Austrian writer whose books acts as a primary source of inspiration for Anderson) are also included on page 215. In short,The Wes Anderson Collection: The Grand Budapest Hotel is a masterpiece and acts as the perfect companion to the Wes Anderson’s film. It’s lavishly illustrated by Max Dalton and the information contained easily put any DVD and Bluray extras to shame. So get ready to surrender yourself to the quirky world of Wes Anderson. Thanks for the time reading this short review. 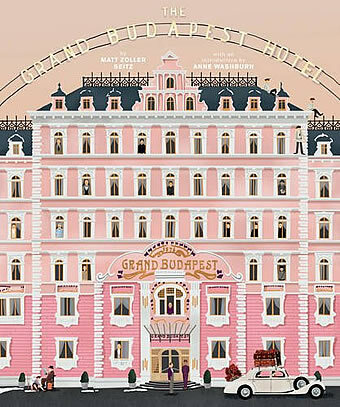 Click to access our The Grand Budapest Hotel movie review and DVD review.